Day 3 started early again at 4:30am! We headed out in search of the birds. We had a full day ahead of us with a lot of potential birds to see! We decided to stop first at San Pedro House. 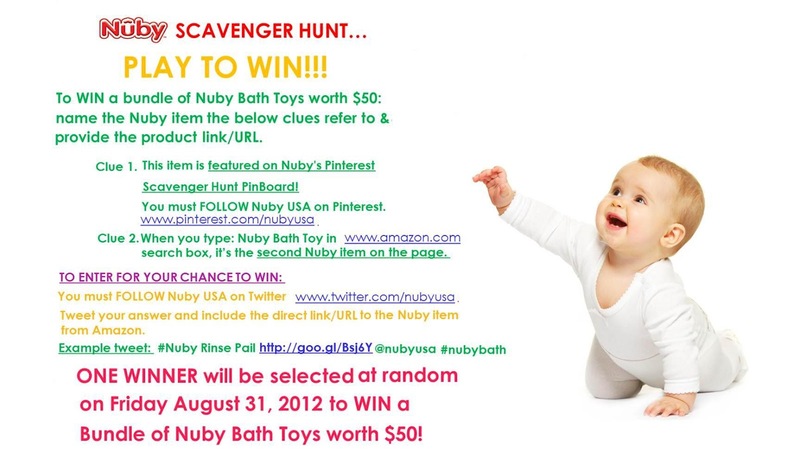 Nuby's very first Scavenger Hunt, Twitter Party and Game day Contest! 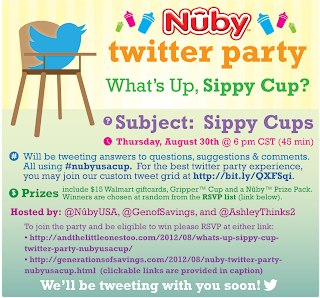 Everyone at the Nuby office is very excited about all the events and we hope that you will join in on the fun too! Check out these amazing giveaways! 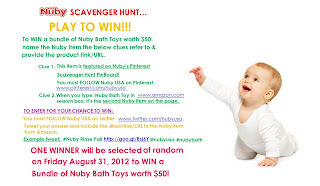 How awesome a scavenger Hunt Giveaway and Twitter Party! Totally awesome! Check out this madness! Do you send a toothbrush with your kid to school? I think it's important to teach our children proper oral care and let's face it mom's no matter how healthy you pack a lunch, vending machines, other kids lunches, and sometimes the food offered at the cafeteria can be full of sugar or fat and all could be traded for the lunch you packed. It would seem that the lunch exchange is just a part of growing up and learning to barter in order to obtain something you want. What you can do is help protect your kid's teeth from what they might put in it! This is gaining in popularity and now even some preschools or full time Kindergarten will allow toothbrushes and tooth paste to be used after meals. So, what do you send for this? Blogger sign up for the Nature Pals mobile and Gymini Giveaway! Chances are you know someone who would love to have this for their little bundle of joy or you would love it yourself and chances are, so do your readers! Sign up to offer your readers this amazing giveaway and best part is its FREE! This free event is for the Nature Pals mobile and Gymini! 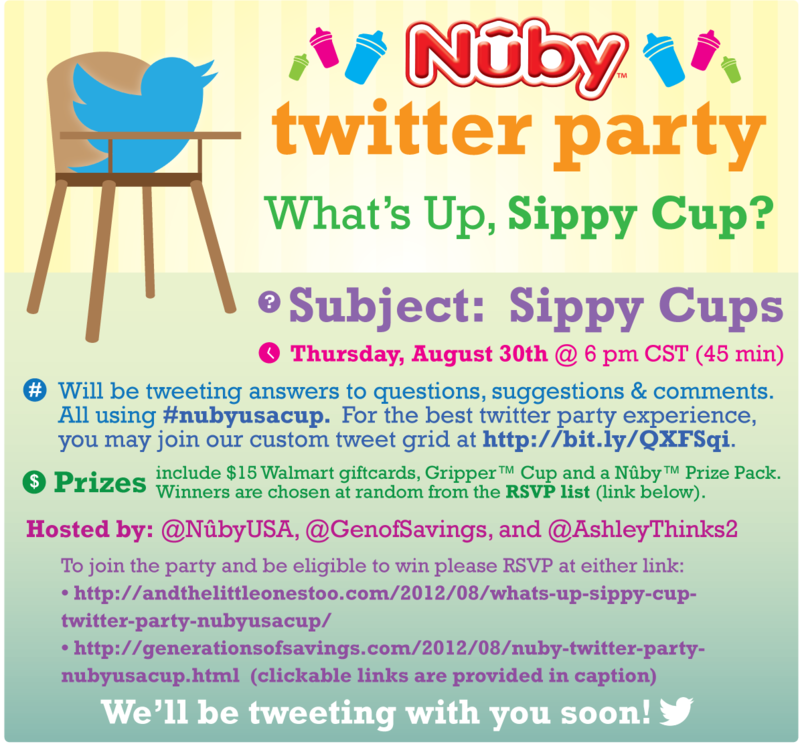 If you'd like to join this free even simply sign up here! Mommy Moments with Abby Signed up! Did you? From Slaughter Ranch at the boarder we drove up to Chiracauhua National forest in hopes of seeing a Flame Colored Tanager. We ran into some very nice birders who informed us that they had not seen the bird but found the nest. Sadly, it was speculated the nest had been abandon and the bird moved on. Talk about disappointment. Bloggy Whatcha Want Christmas Giveaway Sign Ups! What a Christmas Giveaway Blogger Sign up? Yep, starting early this year! Do you love your breed? I have 3 mixed breeds and so I love them all! I love that there are so many ways to show off your puppy love! So, when I was asked to review Love your Breed I jumped at it! Seriously, who can pass up these adorable ways to celebrate your pup?! Early to bed means early to rise. We were up at 4:30am and out the door a short time later headed out to Slaughter Ranch. We were up before the sun and it greeted us with a glorious splendor. If you have kids and carpet chances are you have gotten a spot or two at some point. I run a daycare, so you can imagine the spots I get! At some point every 1-2 weeks I end up trying to get ride of the one's that I don't see happen, but notice later. I'm always looking for something to do the job and not take forever! After bidding the Patton's House adieu, we headed down the road to the Patagonia-Sonora Preserve. It was nicely shaded and upon getting out of the car I caught a sight of blue which I thought was an Indigo Bunting, but it turned out was a Blue Grosbeak upon hunting him down. Still a pretty bird. Back to School means your kids will bring home a lot of bugs. Both figuratively and literally bugs are exchanged and transferred from kid to kid and as a mom we must be prepared for anything that may walk in the door with out kids. One bug that we all know about and no one wants to think about it Lice. What is all the Hullabalu? I love it that my kiddo's get to have a special friend to carry with them when they need a little comfort. They have to share so many of their toys that being able to give them that only yours friend to nap with or play with when the daycare kids are gone is important to me. My daughter has her rabbit and my son needed a friend of his own. So, I ordered Ziggy for him to have and was so glad I did! From Madera Canyon we headed down to Patton's Place. We had read a lot about this place and were excited to take a look. The first thing I noticed was that this amazing birding paradise was that it is for sale. I will say I can only hope that whom-ever buys it keeps it a bird paradise and a haven for birders from everywhere, I couldn't help but notice there seemed to be a little guest cottage and if whomever purchases it decides to open that for rent I would love to help with advertising by testing it out and writing a review on the blog (sorry, shameless plug for myself). Now, with the birds! We started our day with a vigorous hike and then went to our favorite feeders at Santa Rita Lodge on July 7, 2012. Awake at 4:30am to start our crazy trip we definitely needed a few minutes at the feeders before heading on. There is always a start to any adventure and sometimes the end isn't when you expect it. Early in July my husband and I went on a birding bonanza. We saw many birds, but were saddened to learn that some of the rare birds we expected to see may not be there due to a fire in previous years. So, when he spotted a report of the bird we missed, it was the perfect way to end that journey even if it wasn't when the trip had originally ended. In July my husband and I took a trip to Southern Arizona, posts regarding the trip soon to come, when we got very lucky with a sighting of a Short-Tailed Hawk. My husband reported the sighting including the photo's I took of the bird to AZFO or Arizona Field Ornithologists. We were surprised to find they had not had many photo's submitted that had been confirmed documentation of the bird. We had a shot at the first official photograph of the bird in the area! Since, submitting the photograph for confirmation it has been a waiting game.....until now! 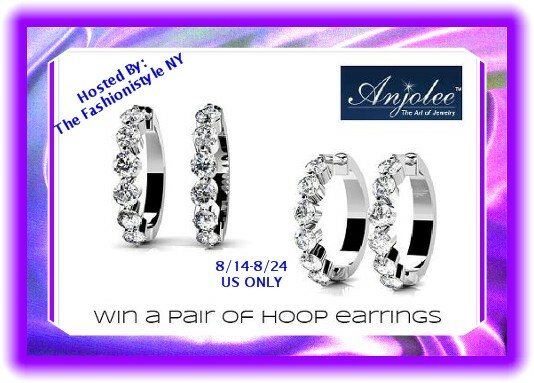 Win These Beautiful Hoop Earrings! I love these earrings and wish I could win them!!!! Anjolee was founded in 1977 as a high-end jewelry manufacturer. Anjolee’s product line has expanded throughout the years and includes an extensive collection of bridal jewelry, engagement rings, diamond bracelets, earrings, strand necklaces and pendants. Summer isn't over and if you have been in the pool all summer like I have your hair is getting mad! I already live in a hot environment which loves to dry my hair out, but going in the pool as much as I do to cool off and my hair feels the brunt of my indulgence. While having dry cracky hair is a problem, it's a bigger problem when you are planning two weddings! Yeah, can't have bad hair on the big hair. So, finding a solution for the pool damage is needed! There are spooky sounds in our future and songs that go bump in the night! October will be here before you know it and the kids will be wanting some creepy songs to dance. Lucky for me I review Children's Music. Here is one of the good Halloween CD's that any Haunted House must have for their Monster Mash! Xbox 360 Blogger Sign Ups! Get Followers and Give away an awesome Game Console your readers will love! I just set up a new profile and need all the help I can get to boost my page numbers! If you can just click below and Like me on Mom Blog Society a great social media for mom's, bloggers, and everyone else I would gladly return the favor! Just post your MBS page below in the comments and I'll make sure to Like your page as well! Thanks for all the help! Now, click away! 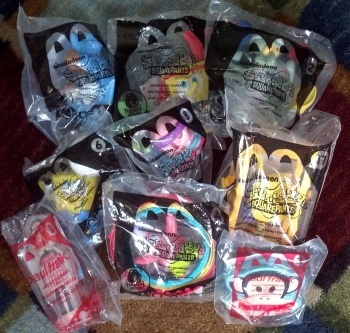 You can Collect them or play with them but everyone love a Happy Meal Toy! One lucky winner will receive ALL NINE Toys! Seven are SpongeBob toys, the other Two are Paul Frank Monkey Toys. This Giveaway is sponsored by Mom Does Reviews. De-Stress and Sooth your skin with some home remedies! I don't know about you but sometimes I need to decompress, perk up, or treat myself and my body, but who can afford a spa? Here are a few of my home remedies/recipes that help you save a few bucks and still treat yourself! School means extra's of everything! It’s back-to-school time and that means you need to get new clothes to last the year or at least until Christmas, school supplies, hair accessories, backpacks(get a back up in case it brakes) and new shoes! So, that means it's time to start looking for deals. Quality and quantity are the key to a good deal if it's anything being used by an active kid! Shoes, are the hardest for me, with feet that grow fast I have to get two of each style or they won't last to Christmas let alone the year. So, I needed to find a deal that allowed me to save on double shoe purchases. Shark Week at Sea Life! Each week, 2-3 days, we do a 15 minute yoga work out in my home daycare. Kids from 1 1/2 to 5 do this and while each does as much as they are able and in a way they are capable of they all get a nice stretch, a scheduled work out time, and some fun new body movements. We do the sun salutations and then add a few jumps, hops, new yoga pose, and teacher assisted summersaults at the end. In doing these poses always consult a doctor first, only attempt what is in your child’s ability level, and do what is comfortable for your and their body. Today we worked on Pyramid Pose or Parsovottonasana. Each week, 2-3 days, we do a 15 minute yoga work out in my home daycare. Kids from 1 1/2 to 5 do this, while each does as much as they are able and in a way they are capable of they all get a nice stretch, a scheduled work out time, and some fun new body movements. We do the sun salutations and then add a few jumps, hops, new yoga pose, and teacher assisted summersaults at the end. In doing these poses always consult a doctor first, only attempt what is in your child’s ability level, and do what is comfortable for your and their body. Today, we worked on Forward Fold or Uttanasana. Yesterday, we made a Puppet Theater, so what about the puppets? You can make puppets out of anything. In the past I made some out of socks you can check out HERE, but here are a few more idea's! Kids can pretend with almost anything and they can really pretend with things they make themselves.